I have noticed that the Academy M-10 (Achilles) hull is too steeply angled when I compare it to photographs of the real thing. Recently I had a chance to measure a real M-36 placed at a war memorial museum in Seoul, Korea. My measurement was done using a protractor and a tape ruler. It may not be100% accurate but it should be reasonably accurate. 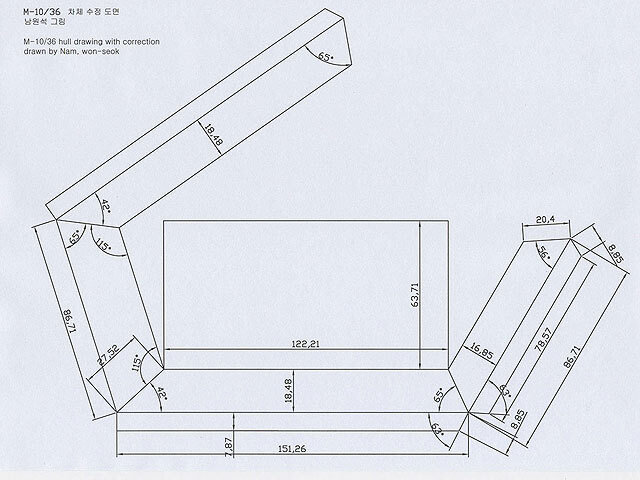 I drew the revised measurements using a CAD program. I compared my own drawing to Cookie Sewell's drawing in Finescale Modeler on May 1995. The two drawings are very similar but slightly different here and there. Based on my measurement and some pictures on Squadron in Action, the Academy hull top (the top most) line looks accurate (120.4mm x 63.5mm in 1/35). After cutting the plastic plate using my drawing as a template and adding on Academy hull with necessary modification on hull front plate and side bottom plate, the result is more realistic M-10 hull. The measurement units in the drawing is 'mm' in 1/35 scale and the angle is 'degree'.